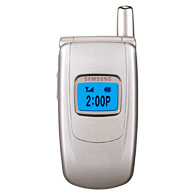 The Samsung SGH-S500 is a dual folder powerhouse which comes equipped with stylish features,powerful capabilities, and utilizes a high-end key pad enhanced with a brushed chrome finish. And it means business! Coolnewmobile - Offering the latest Contract Phones including the Samsung S500 at the most competative prices around. We offer fantastic mobile internet phones all with FREE text messaging*, If you want an O2 mobile phone why not buy it now from O2. They also have some good deals on the Samsung S500.